It's not an end to the disaster of this year's closure of the West Coast salmon fisheries, but it's an encouraging sign. The San Francisco Chronicle reported today that a small, but healthy community of coho salmon have been found in the Garcia River watershed in Mendocino County, California. 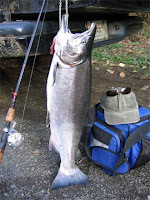 The coho, the core of the Alaskan salmon fishery, is endangered here in California although it was once enjoyed an abundant presence. Even more significant, however, is that the Garcia River watershed has been clear cut not once, but twice, and is now part of a cutting edge experiment by the Nature Conservancy and the Conservation Fund to find ways to promote natural development while permitting selective logging.